Discussion in 'Amps and Cabs' started by infiniteposse, May 3, 2016. I've read a number of recommendation threads and while they've been really helpful, they're almost always quite vague on the front end of things. 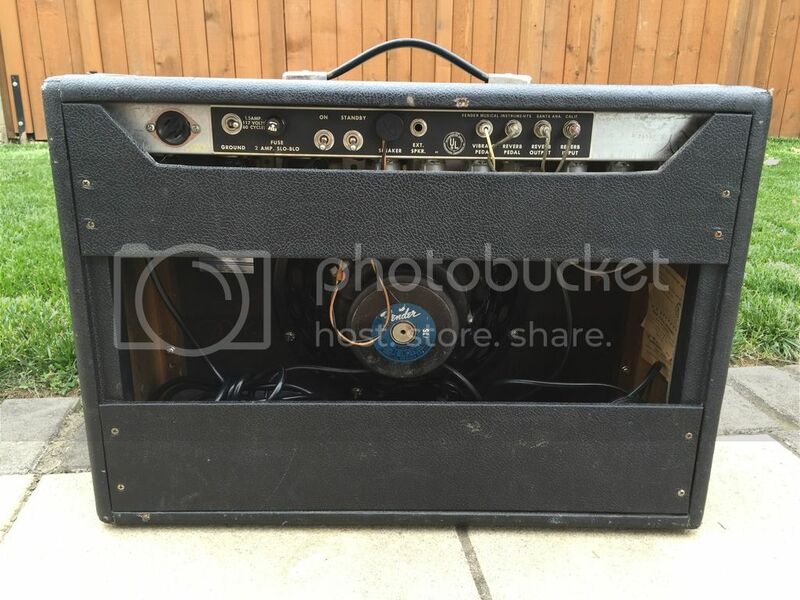 I'm interested in a speaker for this amp that will work for a very specific type of application. I almost always use pedals for drive and fuzz. I don't need the amp to really drive itself, necessarily. The music covers a bit of ground from indie-rock to alt-country to more folky stuff. I don't tend to play super loud and the context I imagine the amp being used in at the moment is more recording or well mic'd environments. I have a 79 Vibrolux Reverb if I need more cut and coverage. I've got a 70's CTS in it at the moment that sounds nice but that's breaking up quite early. It is warm and have a nice warm low-end, but I'd almost say it's bass heavy at the moment. With the older CTS, there's plenty of treble available with all of my guitars at the moment and the between the controls on the amp and my guitars, I can control the high-end well. No ice-pick here. There's some rattle because of the drip-edge surround and I think I'll likely be buying a new baffle for the amp which I think will help improve things sonically. I'm not sure how pertinent that is to the discussion of speakers, but it seems like it could be relevant. Given all of that information, is there a particular speak that seems like a good fit for me? Jonathan Byrnside and Tread like this. I would look at a Scumback M75 for a more British tone or an Eminence Red, white, and blues for more of a fat American tone. Its hard to beat a Gold with the Deluxe Reverb, having owned a few just like yours. I recently sold a vintage Deluxe Reverb and I was using a Steamboat Hemp 100 (like a Mesa C90 with a Tone Tubby hemp cone). That saves some dime compared to Alnico. The Eminence Red Fang is a bit cheaper than the Gold and still has that Alnico thing going on. I have a '71 SFDR. While I tend to be more of a blues-rock guy, I've had incredible success with both a Vintage 30 and a G12H30 Anniversary. For Ceramic Id look into a Fane Ascension F70. 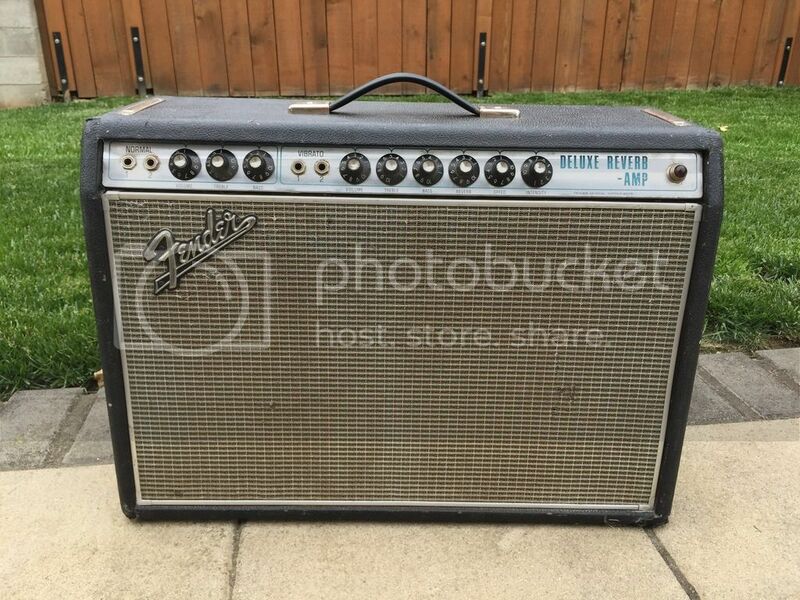 I'm in Portland and have a Celestion V30 and Celestion A type if you want try (message me if interested). The old Jensen C12-N is really nice with fuzz. For alnico, the Tone Tubby Red matches a DR.
which is now my favorite ceramic speaker for 6v6 amps. Gotta say, OP, I use my DR in a similar way as you are wanting to use yours - and a V30 absolutely gets me there. That would be my recommendation too. It's loud. At about 99db, the volume knob stays around 3.5 for house jamming. I can go up a little louder without annoying the wife, but better if I have the house to myself. But on the flipside, I play at home 95% of the time and its not uncontrollable in that setting. It's clean. I can get fairly substantially loud cleans. By 5 there's a little break up. By 6 it's getting there. Single coils. For reference the stock Utah was mostly breaking up by 4. Sounds great with pedals (snip the bright cap though). The speaker isn't too bright or too focused on any frequencies. Typical Fendery scooped mids. Fuzz, OD, distortion all sound great. I like to run a klone at the end of my chain to add in extra mids as needed. I play similar styles as well as blues and it shines. I will say, I do NOT like British speakers in Fender amps. I want my fender cleans to sound like a fender cleans. Some light OD, lots of reverb and I'm in heaven. First question. Does it have fresh electrolytics? I know I know you asked about speakers but weak filter caps kill headroom and speakers get blamed alot. That said. I'm currently running an old C12N in my BFDR. Tried others and ended up where I started. Have to admit I don't use that amp much unless I can crank it up. So something lower efficiency might be better for me but as long as I get it past 4 I'm happy with it. I would check out the Eminence Tomo Fujita signature speakers. They were designed to put in a pro reverb. Essentially sound like a good c12n but hold up when driven. I would think they would also sound good in a deluxe. This x10. Putting a fresh round of caps in my 73 changed the amps headroom (and bass response) dramatically. Like not, "oh that sound a little better". More like "is this the same amp? Where did this tone come from!?" Yup. Fully serviced and a good compliment of tubes. There's no rattle from the drip edge. Forget that. -The Emi GA SC 64 is the best I've ever had in a DR.... right out of the box. 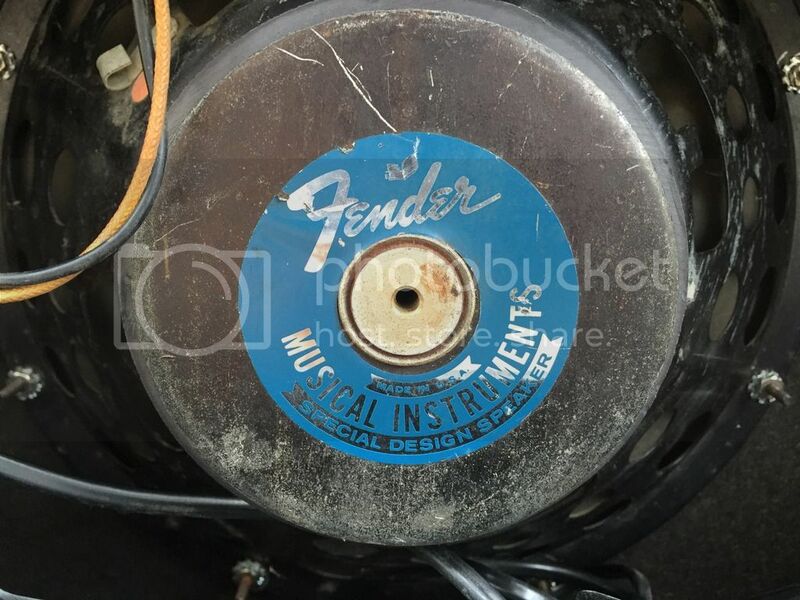 -A well broken in Weber 12F150 is the second best. But the one I had was a super old one. -I have a Legacy in one of my Deluxe's right now. It's cool, but different, more scooped, less distinct etc. - A Weber Silver Bell is nice also, kind of in between a 12F150 and the Legacy. And that's the one on my list I haven't tried...stop making me want to spend money please? Yeah I hear you. I have probably had 20 different speakers in my DR's over the last 15 years. Everything from JBL's to vintage Jensens. Most of them I tire of after a couple months. The SC64's been in there at least 9 months. I've never been a huge Emi fan, but they did something with this one. Not overbearing highs, not overbearing lows, not too much breakup.. just got it all. The gold is awesome, just needs a lot of break in time. You almost gotta leave it with a looper on loud for some hours before judging it. The most popular Tone Tubby for a Deluxe Reverb is the Alnico Red, followed by the 40/40 ceramic. I think the San Rafael works pretty well too if you want to encourage some tight and early breakup.